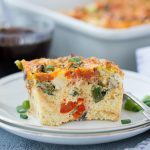 Easy breakfast casserole with bread loaded vegetables, egg, bread and topped with cheese. This Breakfast Casserole recipe can be made ahead and perfect to feed a big crowd. Start with heating oil in a pan. Add Mushroom. Cook 5-6 minutes until the mushrooms start to soften. Then stir in Pepper and Tomatoes. Cook for 1-2 minutes. Season with salt and pepper. Add Chopped Spinach. Mix well. And cook for another 1 minutes. Keep aside and let it cool. In a bowl whisk eggs with milk. Season with salt and pepper. Stir in Chopped Spring Onion and Cooled Vegetable mix. Add the Italian Seasoning and chilli flakes. Mix well. Take an 8-inch baking dish. Arrange broken bread pieces at the bottom. Pour in the egg and vegetable mixture. Distribute it evenly. If you are doing the prep the night before, then tightly cover the pan with aluminium foil and keep in the refrigerator. OR if baking on the same day then skips to the next step. Bake in the preheated oven at 180 degrees Celcius for 35-40 minutes. Towards the end of the baking time, you would see the mixture would have set and start to leave the edges. Sprinkle with more spring onion while serving. Once it is cool, store in an airtight container in the refrigerator up to 4 days.